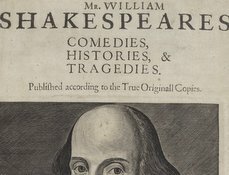 Shakespeare Documented is still growing! Currently, two thirds of the descriptions and 98% of the images are available in the exhibition. Descriptive text will continue to be added, updated and expanded. Visit our About page to learn more about the project scope. 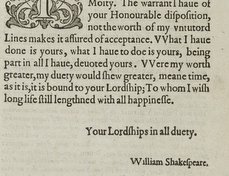 To learn more about searching and using Shakespeare Documented please visit Exploring the Exhibition. Descriptive content and transcriptions will continue to be added, updated and expanded. Check back for regular updates! Greene, John, of Clements Inn. 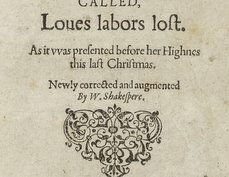 Anne, John and Mary Shakespeare’s sixth child, was baptized on September 28, 1572, according to the Holy Trinity Church parish register. Next to the entry, an “X” added by a later hand highlights its significance. 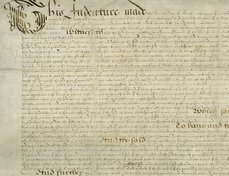 Under Stratford’s 1553 charter of incorporation, the Corporation elected annually a chief alderman to serve as a justice of the peace. He assisted the bailiff in the execution of his office, particularly at sessions of the court of record. Under the 1553 charter of incorporation, Stratford-upon-Avon had been granted a certain degree of self-government, independent of the lord of the manor who had previously held authority over the town's affairs. Richard, John and Mary Shakespeare’s seventh child, was baptized on March 11, 1574, according to the Holy Trinity Church parish register. Next to the entry, an “X” added by a later hand highlights its significance.